What do you know about the best golf GPS watches? One of the huge improvements in the world of golf over recent years is the variety of ways that you can find your distances. In the ‘old days’, there was really one option – you had to use the sprinkler heads located around the course, perhaps with the help of a yardage book, to track down your numbers. It was possible to get an accurate yardage, but you had to work for it. Commonly you would see golfers pacing back and forth and up and down the fairways in order to calculate exactly how far they needed to hit that ball. Thanks to technology, most of that pacing has stopped. Golf-specific GPS devices has been around for more than a few years now, but the category of golf GPS watches is just starting to come into its own. These are devices that do most of the same things that are done by GPS units that you mount on your cart or carry in your bag (like laser rangefinders), but they can be strapped around your wrist instead. The added convenience of this design is obvious. Rather than having to hunt down your GPS each time you need to know the yardage, you can simply glance down at your arm just as if you were checking the time. In a matter of moments, you will know all of the relevant yardages for the shot, and you can pick a club and be on your way. The only real drawback that some golfers may find with products in this category is the fact that you will need to play with a watch on your wrist. For many players, that is not a problem – but it will be uncomfortable for some. Before ordering a GPS watch of your own, be sure to think about whether or not you will be willing to play with a GPS watch on your arm all day long. Below you will find a few of the best GPS watch options on the market today. Pick the one that has the best combination of features and price for your needs and you will enjoy accurate yardages for many rounds to come. This is perhaps the most popular GPS watch in golf today, and there are plenty of reasons why that is the case. For one thing, it comes from Garmin, which is one of the leading names in the GPS world. Also, it comes preloaded with an incredible database of 30,000+ courses worldwide, meaning your favorite track is very likely to be included. It has a battery life of up to 8 hours when you are using it as a GPS, and it can last a full 3 weeks if you are just using it as an everyday watch. In addition to the functionality of this watch, it is also a good looking piece of equipment that is offered in a variety of colors. Yes, it is a watch that is meant to provide you with yardages on the course, but it can easily be worn in your ‘everyday’ life as well. While on the course, it will offer you information such as yardages to the front, middle, and back of the green, as well as a digital scorecard. In all, this is a quality product with all the features you need and a great price as well. 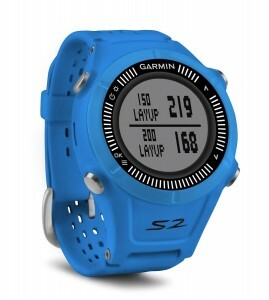 While there are more models to consider in the GPS watch game, you are going to need to take a close look at the Garmin Approach S2 right off the bat. If you are looking for a gps watch for golf that is reliable and well know, but will not break the bank, this may be a good option for you. This Garmin is extremely well known. It’s accuracy is very good. 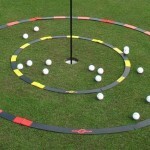 Furthermore, you can get yardages from anywhere on the course, not only the fairway or the tee box. This is a useful tool. 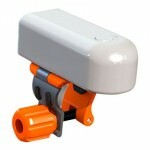 For $149.99, this model does not have too many bells and whistles, but it is reliable and accurate. 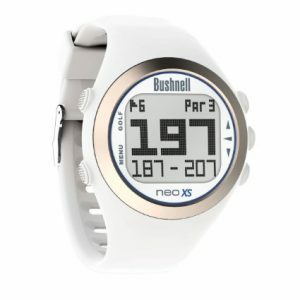 Another one of the leading names in the measurement business, Bushnell offers up this NEO XS Golf GPS Rangefinder Watch which provides the user with many of the same features seen on the Garmin model listed above. Specifically, this watch also has more than 30,000 courses available, it also offers distances to the front, middle, and back, and it can also function as a regular watch when away from the course. Impressively, this unit offers even more battery life, with a stated ability to get you through three rounds of golf on a single charge. As is the case with many GPS models, this watch has yardages to the various hazards that you may find around the course. This information can come in handy for any golfer, as trying to decide whether you should lay up short or hit over a hazard is one of the toughest calls you will make throughout the day. By having an accurate source of information right on your wrist, however, you can make smart choices and keep your ball clear of the hazards a majority of the time. Offered in three different color combination options, it will be easy to pick out the Bushnell NEO XS Golf GPS Rangefinder that best fits your tastes. Bushnell is a famous name in golf distance technology. This watch is only 8 ounces and easy to use. Not only are there many course available, but the USB cable connector is a major asset as more of us have USB adapters in our cars and homes. The watch is a little large and bulky, but still has very good accuracy and reliability. Again here we find a GPS watch that has been preloaded with the GPS data for more than 30,000 courses around the world. This stylish model offers up all of the information provided by the two previous products on our list, so you will always have an accurate yardage to work from when preparing to hit a shot. This one, like the Garmin, has a scorekeeping function available, and it allows you to keep some basic stats as well such as greens hit and putts per round. If you are interested in your fitness while on the course, the GPSy has an odometer as well to tell you just how much you have walked during the day. One of the things that is potentially going to pull you toward the Callaway GPSy over some of the other models on the market is the sleek and stylish look that it offers. This is a sport product with a light and comfortable band that makes it easy to wear all day long. Two colors are offered – black and white – and the display is clear and easy to read. This watch has it all. 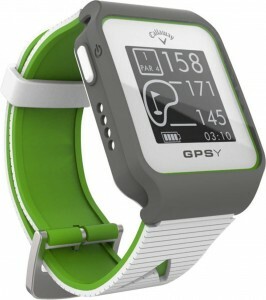 Not only can you get different yardages per different locations on the green, but the watch itself is stylish. It is a little heavier than most golf watches, but it comes with more technology. Being able to score your GIR’s and putts per round is a major perk. Finally it is quite nice to have the watch automatically take you from hole to hole. During a round (especially at a new course), it is easy to forget to watch the hole on your watch. If you are willing to wear a heavier watch and pay the price for this one, the GPSy is a hard model to beat. There are plenty of great golf GPS watches available today, but the three listed above are a strong place to start your search. Think about the features that you find important and then make sure any model you consider has all of those in place. Of course, price is always going to play a role in any purchasing decision, so keep your eye out for sales and make sure you are getting plenty of features and quality in return if you decide to buy a more expensive item. Have fun tracking down the right golf GPS watch for you, and good luck!